Openbravo makes it easy for businesses to become GST-compliant - here's why! The Goods and Service Tax (GST) will radically reform India’s economy creating a common Indian market for goods and services, and bringing important benefits for retailers. For example, manufactured goods could become cheaper, logistics and inventory costs will fall, and the obstacles to e-commerce in India created by state restrictions and levies will reduce. 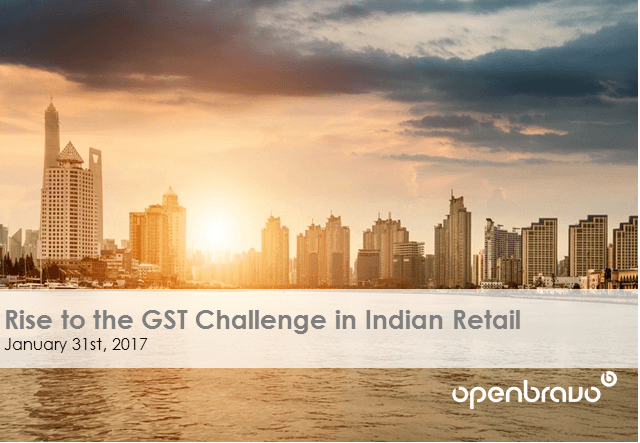 This presentation will examine how Openbravo Commerce Suite can help retailers adapt to the specific GST requirements and take full advantage of the current transformation taking place in Indian retailing. GST must be implemented by September 16 2017 at the latest, so time is running out for retailers that have not yet embarked on a strategy to make their practices and systems compliant with the new GST regime. If you wish to watch the full webinar which accompanies this presentation, please visit http://www.openbravo.com/resources/webinars/?commid=242411.